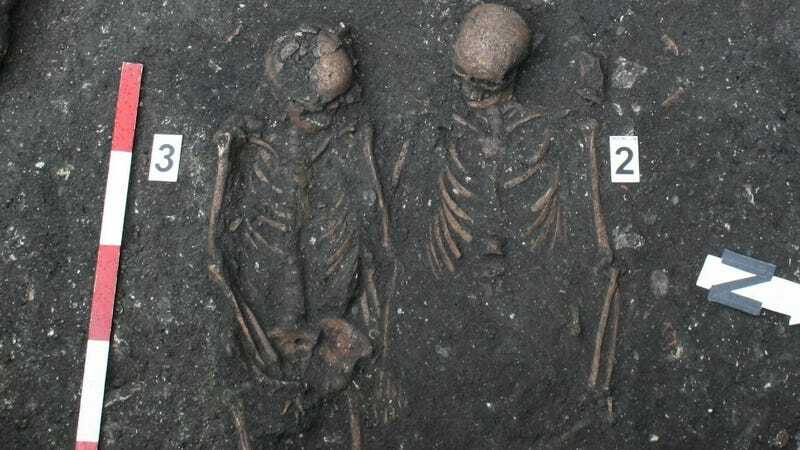 Archaeologists working in Romania’s Transylvania region have discovered a young male and female skeleton from the late Middle Ages who were buried facing each other and holding hands. Locals have dubbed the couple “Romeo and Juliet,” but historians have their own take on the unique double burial. Researchers from the Institute of Archaeology and Art History and the Cluj National History Museum discovered the pair while excavating the courtyard of the Sigismund Toduta Music High School, originally a 15th century Dominican monastery. According to senior researcher Adrian Rusu, the couple probably lived sometime between 1450 and 1550. The male appears to have been killed by a blunt-force blow to his chest, breaking his sternum. It’s not clear what caused the death of his female companion. But while the scene certainly has a Shakespearean quality to it, it’s unlikely that the woman killed herself. She can’t have committed suicide Juliet-style when her man died because she would not have been allowed to be buried in consecrated ground, and certainly not within the hallowed walls of a monastery. Perhaps, Rusu speculates, she died from a heart attack or a stroke brought on by the shock of his accidental death. Sure, he is totally pulling that explanation out of his fundament and his appreciation for the PR value of our collective cultural vernacular, but it is mysterious that they died fairly young, at the same time and only one of them shows signs of fatal trauma. I can think of several explanations that don’t require the broken heart ex machina, though. She could have died first of an illness that can’t be detected in the bones or that hasn’t been yet. She could have had an unfortunate encounter with the wrong mushroom. The male then entirely by coincidence had some kind of workplace accident or tangled with the wrong horse that broke his sternum with one well-placed kick. Really, there are many possibilities. The researchers also uncovered the skeleton of a child and a fourth incomplete skeleton. Source: Romania-Insider and History Blog.